The Next Beatles. It’s a phrase that has gotten tossed around a lot since the breakup of the world’s most famous band. For those bestowed with this accolade, it was a considerable compliment. Sometimes, it was also a curse. After all, who could possibly match the songwriting and musicianship of The Beatles, let alone their humor, camaraderie, and cultural influence? There never will be another Beatles, but there are bands that are “Beatlesque.” What makes a band “Beatlesque?” Almost every rock group (not to mention modern jazz and classical musicians) has been influenced by The Beatles, so we need to narrow the criteria. First of all, let’s eliminate other British Invasion bands that were coming up around the same time as The Beatles. That leaves out The Rolling Stones, The Kinks, The Yardbirds, The Zombies, and numerous others. Second of all, they’ve got to be a band — not just a singer/songwriter with a backing band. We’re looking for multiple songwriters and multiple vocalists. Three guitars and drums are ideal, although we’ll accept the occasional keyboard. A few Beatlesque songs doesn’t get you on the list (sorry Tears for Fears). The band needs to have a history of harmonically rich, melodic, singable songs with lyrics that lean towards the optimistic with flashes of humor. More serious lyrics, including the political and romantic kind, are also welcome. The music can be reminiscent of The Beatles’ early music or it can draw from the orchestral and psychedelic touches of The Beatles’ later music. Aside from their musical talent, we’re looking for bands that like to experiment and evolve. But just because a group is experimental doesn’t necessarily make them Beatlesque (I’m talking to you Radiohead). And although one can make the point that the Beatles helped to birth progressive rock, there’s no place for poetry, extended drum solos, or album-side suites here. (Goodbye Yes, Pink Floyd, and The Moody Blues.) Finally, we give out bonus points for a specific connection to The Beatles. Badfinger began as a cover band called The Iveys, playing the hits of the day, including songs by The Beatles. At one point, Ray Davies of The Kinks offered to produce them, but nothing came of that. After Beatles’ roadie Mal Evans saw them perform at the Marquee Club in January, 1968, he played their demos for each of The Beatles. Later that year, they became the first non-Beatles artist signed to the new Apple record label, and they were given the name Badfinger courtesy of Apple Corps’ Neil Aspinall. Badfinger sounded so much like The Beatles, many listeners mistook one group for the other. Although Badfinger’s first hit, “Come and Get It,” was written and produced by Paul McCartney, singer/songwriter Pete Ham (with occasional help from his bandmates) composed their other hit songs, including “No Matter What” and “Baby Blue.” Despite their early successes, they ultimately left Apple, and their album sales plummeted. After repeated disappointments, Ham committed suicide in 1975, and his bandmate Tom Evans followed in 1983. Badfinger is definitely an example of “The Next Beatles” label acting as a curse. Sample Beatlesque Song: “Day After Day” (produced by George Harrison) from the 1971 album Straight Up. Beatles Connection: In addition to being discovered and produced by various Beatles, members of Badfinger played on George Harrison’s All Things Must Pass, John Lennon’s Imagine, and Ringo’s “It Don’t Come Easy.” The entire band backed up George Harrison and others at the 1971 Concert for Bangladesh. The Bangles, the only female band on this list, formed in Los Angeles in the early 80s. From their guitar/bass/drums structure to the poppy songwriting of Susanna Hoffs, Vicki and Debbi Peterson, and Mikki Steele, The Bangles sounded like a female version of The Beatles in their pre-psychedelia days. No surprise since the group was obsessed with The Beatles, according to Hoff. Although their first album received good reviews, it was their second album Different Light that propelled them to stardom with the Prince authored “Manic Monday” and “Walk Like An Egyptian” written by Liam Sternberg. Friction led the band to break up soon after the release of their third album, 1988’s Everything. Since reforming in 1998, they have produced two excellent albums, 2003’s Doll Revolution and 2011’s Sweetheart of the Sun (the latter album without Micki Steele). Sample Beatlesque Song: “Here Right Now” from 2003’s Doll Revolution. Beatles Connection: After ten years without appearing together, The Bangles reunited at the request of George Martin for a Beatles tribute at the Hollywood Bowl in June of 1999. Tensions in the band were high from the very beginning, exasperated by increasing drug use and disappointing record sales. Bell left the band after their first album, and Chilton led the group through two more albums before the group disbanded. Although there were several partial reunions, Big Star never again reformed with their initial line up. Big Star was a great band that never received the attention it deserved. Today, numerous artists point to them as an influence. Sample Beatlesque Song: “September Gurls” from 1974’s Radio City. Often referred to as the American Beatles, The Byrds started out as a folk trio formed by Jim “Roger” McGuinn, Gene Clark, and David Crosby. Soon after becoming enamored with The Beatles, the Byrds released their 1965 debut, Mr. Tambourine Man. On that album, they married the folk songs of Bob Dylan and Pete Seeger (along with songs written by Clark and McGuinn) with electronic guitars and stacked vocal harmonies. In doing so, they helped to birth the sound of folk rock that would in turn influence The Beatles on their album Rubber Soul. Like The Beatles, The Byrds seemed to progress with each album — from the folk rock of their first two albums to the psychedelia of 1966’s Fifth Dimension, 1967’s Younger Than Yesterday, and 1968’s The Notorious Byrd Brothers. Although the lineup shifted for each album as various band members left and returned, it was the addition of Gram Parsons for 1968’s Sweetheart of the Rodeo that moved The Byrds into country rock, becoming one of the first bands to pioneer this new sound. Sample Beatlesque Song: “Have You Seen Her Face” from 1967’s Younger Than Yesterday. Beatles Connection: It was Roger McGuinn’s 12-string purchased after seeing George Harrison play one in A Hard Day’s Night that helped create the sound of The Byrds, and it was The Byrds’ version of “The Bells of Rhymney” that inspired George Harrison’s “If I Needed Someone” on Rubber Soul. Most importantly, it was McGuinn who first exposed The Beatles to the sounds of sitarist Ravi Shankar, influencing Harrison’s lifelong love of Eastern music. Another contender for the American Beatles, Cheap Trick took The Beatles’ sound and turned it up to eleven! Singer Robin Zander’s voice could deliver the full spectrum of McCartney’s vocals, from tender ballad to full-throated shouting, while drummer Bun E. Carlos held down the beat with his Ringo-influenced drumming. Along with guitarist Rick Nielsen and bassist Tom Peterson, Cheap Trick built a strong following overseas with their first three albums. It was 1979’s multi-platinum Cheap Trick At Budokan, a live album that was not even planned for a U.S. release, that ultimately helped them conquer America. Cheap Trick’s songs, like “I Want You To Want Me,” “Surrender,” and “Dream Police,” paid tribute to the hooks and harmonies of The Beatles, adding lyrics that caused one to smile. They worked with Beatles producer George Martin on 1980’s All Shook Up and with Beatles disciple Todd Rundgren on 1983’s Next Position Please. After losing focus in the late 80s with a series of disappointing albums, they regained their footing with 1997’s self-titled album and continued with a string of excellent recordings through their latest, 2016’s Bang, Zoom, Crazy… Hello. In 2016, Cheap Trick was inducted into the Rock and Roll Hall of Fame. Sample Beatlesque Song: “I Can’t Take It” from 1983’s Next Position Please. Beatles Connection: Besides working with George Martin, members of Cheap Trick were part of John Lennon’s backing band for the recording of Double Fantasy, although their contributions were later replaced by other musicians. In 2009, Cheap Trick released a recording of their live performance covering the entire Beatles’ album Sgt. Pepper’s Lonely Hearts Club Band. From the American Beatles to the Australian Beatles — Crowded House. Formed as a trio in Melbourne, Australia in 1985 by former Split Enz members Neil Finn and Paul Hester along with bassist Nick Seymour, they produced four critically acclaimed albums between 1986 and 1993, often with the addition of other musicians, including Neil’s brother Tim. Neil Finn, the primary songwriter, composed catchy songs with clever lyrics and beautiful chord changes that were reminiscent of Lennon and McCartney’s songs. Singles like “Don’t Dream It’s Over,” “Better Be Home Soon,” and “Something So Strong” helped the band achieve huge success worldwide. Finn and Seymour reformed Crowded House in 2008 shortly after Hester’s suicide in 2005. Since then, the band has released two albums, 2007’s Time On Earth and 2010’s Intriguer. Sample Beatlesque Song: “Not the Girl You Think You Are” from 1996’s Recurring Dream. Jeff Lynne, a member of The Move and a co-founder of the Electric Light Orchestra, wears his Beatles influence on his sleeve. He joined The Move for their second album and helped create funny, poppy, psychedelic songs that could have been outtakes from later Beatles albums. With bandmates Roy Wood and Bev Bevan, Lynne dreamed of a group that would combine strings with a traditional rock band in the style of songs like “I Am The Walrus.” The result was the Electric Light Orchestra. Wood left after ELO’s first album, and Lynne continued on, producing a series of classic albums, including 1975’s Face The Music, 1976’s A New World Record, and 1977’s double album Out Of The Blue. Acting as the band’s main songwriter, Lynne created Beatlesque songs with string arrangements that would make George Martin proud. Throughout his long career, Lynne and ELO have dabbled in disco (1979’s Discovery), concept albums (1974’s Eldorado), and the American songbook (1990’s solo album, Armchair Theatre). Lynne has recorded and produced albums since the 1970s — with ELO and solo. Lynne recently embarked on a tour performing ELO songs, including songs from their most recent release, 2015’s Alone in the Universe. Sample Beatlesque Song: For The Move: “Beautiful Daughter” from 1970’s Shazam. For ELO: Almost anything, but I’ll pick “Shangri-La” with its lyrical reference to “Hey Jude” from 1976’s A New World Record. Beatles Connection: Many. Lynne played with George Harrison in The Traveling Wilburys. He produced The Beatles “reunion” songs, “Free As A Bird” and “Real Love.” And he played on albums with Paul, George, and Ringo. The Flaming Lips sound like The Beatles if they had been set loose in the studio with an unlimited collection of electronic instruments and an inexhaustible supply of L.S.D. There is no doubt that the Lips are one of the most ambitious groups still making music today. The Lips were formed in 1983 in Oklahoma City by brothers Mark and Wayne Coyne and bassist Michael Ivins. After releasing their self-titled debut, Mark left the band, and Wayne took over as lead vocalist. When drummer and multi-instrumentalist Steven Drozd joined in 1992, the band began releasing a series of critically acclaimed albums beginning with 1993’s Transmissions from the Satellite Heart through 2013’s The Terror. They have deliberately avoided any attempt at mainstream success, which allows them to do whatever they want live and in the studio. Among their more unusual experiments are 1997’s Zaireeka, four compact discs meant to be played simultaneously on four separate CD players, and 2011’s Gummy Song Skull EP released on a flash drive buried in (you guessed it) a seven-pound gummy skull. Sample Beatlesque Song: “Race for the Prize” from 1999’s The Soft Bulletin. Beatles Connection: In 2014, the Flaming Lips along with a series of guests (including Miley Cyrus) released With A Little Help from My Fwends, one of the strangest takes on The Beatles’ album Sgt. Pepper’s Lonely Hearts Club Band. 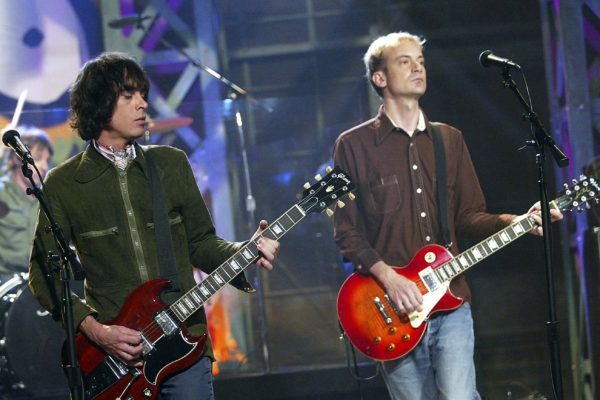 The songwriting team of Adam Schlesinger and Chris Collingwood formed Fountains of Wayne in 1995. Together with lead guitarist Joey Porter and drummer Brian Young, the band performed hook-filled songs that sounded like they could have come off of a Beatles album. After releasing five albums between 1996 and 2011, the band has no current plans to reform. Schlesinger and Collingwood have gone on to other projects — Schlesinger is currently writing songs for the CW series Crazy Ex-Girlfriend while Collingwood recently released a new album, Look Park. Sample Beatlesque Song: “The Summer Place” from 2011’s Sky Full of Holes. Beatles Connection: FoW performed a cover of “Help!” for the 2003 movie Cheaper By The Dozen. The Knack falls into the category of band’s cursed with the “Next Beatles” label. The Knack’s original members, singer/guitarist Doug Fieger, lead guitarist Berton Averre, bassist Prescott Niles, and drummer Bruce Gary, met in 1977 and 1978. Within months of their first live performance, The Knack were greeted as the Next Big Thing and were being accompanied on stage by superstars like Bruce Springsteen and Tom Petty. Their first album, Get the Knack, burst on the scene in 1979 along with their smash hit, “My Sharona.” The Knack were positioned to become The Beatles of the 1980s. Not only was the album’s name and cover a take off on Meet the Beatles, but the album’s songs (written by Fieger and Averre) imitated the early Beatles pop sound (complete with harmonica) with slightly more lascivious lyrics. Unfortunately, their quick rise to the top was followed by a critical backlash exacerbated by The Knack’s refusal to talk to the press, and the band never again achieved the success of their debut. Get the Knack sounds like a 1980s update to Meet the Beatles. After the disappointing follow-up …But the Little Girls Understand, the band tried for a comeback in 1981, moving into Revolver territory with Round Trip and more complex songs like “Africa” and “Art War.” Although it was produced by Jack Douglas, fresh off of producing Lennon’s Double Fantasy, the album was another flop. Subsequent albums fared no better. Yet, Get the Knack still stands as one of the greatest Beatlesque albums. Sample Beatlesque Song: “Good Girls Don’t” from Get the Knack. The Monkees were basically manufactured to be like The Beatles. The idea was to create a fake rock band with four zany personalities that would appeal to teenagers and grownups alike. The band would star in a TV show documenting their crazy antics while performing songs written by some of the finest songwriters available, including Carole King and Gerry Goffen, Tommy Boyce and Bobby Hart, and Neil Diamond. When The Monkees hit the airwaves in 1966, they were an instant success, and their singles and albums topped the charts for the next two years. What no one expected was that Micky Dolenz, Michael Nesmith, Peter Tork, and Davy Jones would go on to become fine musicians and songwriters in their own right. Although their original recordings featured studio musicians, including the famous Wrecking Crew, The Monkees played on their later recordings. Nesmith was contributing songs from the beginning, and the other three Monkees would also became songwriters. During the late 60s, The Monkees tried to leave behind their “made-for-TV” image by making darker and more psychedelic music, as well as starring in 1968’s satirical film Head. Unfortunately, this caused their popularity to decline. Soon after Head, Nesmith would leave the band and have a successful career as a solo artist (one of the founders of country rock) and a pioneer of home video. Although they never again achieved the success of their heyday, Nesmith and the other Monkees continued to tour and record in different combinations even after Jones’ death in 2012. Their recent album, 2016’s Good Times!, has received excellent reviews (including one from CultureSonar!). Sample Beatlesque Song: “Mary, Mary” from 1967’s More of the Monkees. Beatles Connection: Despite starting out as a blatant Beatles rip-off, the four Beatles enjoyed the four Monkees and generally had nice things to say about their music. Nesmith was with Lennon when he purchased the circus poster that influenced “Being for the Benefit of Mister Kite,” and he attended the orchestral recording session for “A Day In The Life.” Peter Tork played on Harrison’s Wonderwall album. And Micky Dolenz hung out with Lennon and Starr during Lennon’s notorious Lost Weekend. When brothers Noel and Liam Gallagher formed Oasis in 1991, they made no secret of their Beatles obsession. Oasis songs like “Don’t Look Back In Anger,” “She’s Electric,” “All Around the World,” and many others sounded like heavier versions of songs that might be found on The Beatles’ later albums. Unlike The Beatles, the relationships among the members of Oasis were fraught with tension — no more so than between the two founding brothers. Oasis became more recognized for their appearances in the British tabloids than for their music, and they eventually split up in 2009. Still, Oasis ended up becoming Britain’s most popular band since The Beatles. Sample Beatlesque Song: “Champagne Supernova” from 1995’s (What’s the Story) Morning Glory? Beatles Connection: Oasis covered many Beatles songs during their career, including “I Am The Walrus” (a live version of the song appears on the B-side of the 1994 “Cigarettes & Alcohol” single) and “Within You, Without You” (recorded for BBC Radio 2’s 40th anniversary tribute to Sgt. Pepper’s Lonely Hearts Club Band). Chris Difford and Glenn Tilbrook are the John Lennon and Paul McCartney of Squeeze and two of the finest songwriters in popular music. The two guitarists formed Squeeze in 1974. As other band members came and went, Difford and Tilbrook created a string of great albums and hit singles. Difford and Tilbrook’s songs mimic the songwriting techniques that made the songs of Lennon and McCartney so admired. Catchy melodies accompany sing-a-long choruses that never outstay their welcome. The mood of a song can suddenly shift on a surprising chord change. Lyrics are funny, charming, angry, romantic, and poignant — often all in the same song. These songs are brought to life on near-perfect albums like 1980’s Argybargy, 1981’s East Side Story, and 1982’s Sweets from a Stranger. Squeeze continues to make great music today, most recently on their 2015 album, Cradle to the Grave. Sample Beatlesque Song: “Some Fantastic Place” from the 1993 album of the same name. Beatles Connection: Squeeze covered “Please Please Me” in 2013 on BBC Radio 2’s 50th anniversary tribute to the Beatles first album. If we were allowing solo artists on this list, then Todd Rundgren would be a shoe in. Although Todd can’t join the list, his band Utopia can. It was 1980’s Deface the Music that took the band’s Beatles influences to another level. The album was a direct parody of The Beatles music with songs so similar that they might be mistaken for Beatles songs. Although they were never again so blatant in their Beatles tributes, Utopia continued to write and perform Beatlesque songs through their final album, 1985’s P.O.V. 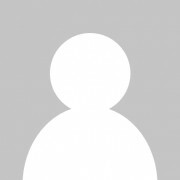 Sample Beatlesque Song: “I Just Want To Touch You” from 1980’s Deface the Music. Beatles Connection: Rundgren recorded several covers of Beatles songs and taught a college course on The Beatles. Today, he is a frequent member of Ringo’s All Starr band. In some ways, XTC is the band on this list that best exemplifies everything that made the Beatles great — superb melodies and songwriting, humorous and poignant lyrics, creative arrangements, and a steady evolution from one album to the next. When XTC released their debut album White Music in 1977, it was filled with short, angular, punk-influenced songs about science, music, and the sexiness of the Status of Liberty. The two main songwriters, Andy Partridge and Colin Moulding, had a knack for melody and a innate ability to write clever lyrics. Still, they might have faded away like many of their new wave contemporaries. Instead, XTC moved forward with each album they produced, just as The Beatles progressed from their “punk” Hamburg days to Please Please Me and then to Rubber Soul and Revolver. By 1982’s double album English Settlement, Partridge and Moulding’s songwriting was becoming more complex and ambitious in songs like “Melt the Guns,” “Jason and the Argonauts,” and their biggest hit, “Senses Working Overtime.” Then, like The Beatles, they gave up touring while continuing to create excellent albums — from 1983’s Mummer to their last album, 2000’s Wasp Star. Throughout their catalog, one can find perfect pop songs, such as Skylarking’s “Earn Enough for Us,” lushly orchestrated landscapes, such as Oranges & Lemons’ “Chalkhills and Children,” and creative arrangements, such as Nonsuch’s “My Bird Performs.” In between, XTC formed an alter ego called The Dukes of Stratosphear and released two psychedelic albums in the style of the 1967 Beatles (as well as Pink Floyd and other psychedelic rock bands). Sample Beatlesque Song: “Mayor of Simpleton” from 1989’s Oranges and Lemons (and “Vanishing Girl” from the 1987 Dukes of Stratosphear album Psonic Psunspot). Beatles Connection: Andy Partridge covered The Beatles’ “Strawberry Fields Forever” on the 1990 compilation 1967: Through the Looking Glass. That’s our list. Who did we miss? Post a comment with your favorite Beatlesque band. PS. We’re doing our part to make your holiday shopping a little easier. Visit our store to find cool stuff to buy. It’s powered by Amazon, so you know you can trust it. Plus, shopping at our store helps support CultureSonar. Everybody wins! The Raspberries would fit nicely on this list – VERY glad (and shocked) to see Utopia mentioned as well as XTC – two of my all-times faves – great article ! Smithereens were an excellent band and had a Beatles vibe. I agree The Raspberries would have fit the list. Another band worthy of the list is The Outfield. Too bad the public may only think of them as a one hit wonder with “Your Love”, but they made 8 studio albums right up to guitarist John Spinks passing in 2014. 1990’s “John Lennon” from ‘Diamond Days’ was a nice song written about John’s life. Their final LP in 2011 titled ‘Replay’ features a bunch of Beatles style tunes. “California Sun” has a nice beat with a Paul McCartney style of bass playing by Tony Lewis. Another track of which is a cover of “While my guitar gently weeps” is very well done. Long live the Beatles and all the bands that remind us of Beatlemania. What about the Bay City Rollers? I remember so much hype about them coming to America and appearing on the Howard Cosell variety show. The Bay City Rollers? Hunter Davies the author of the only authorized Beatles biography,The Beatles said in his book,The John Lennon Letters,that The Bay City Rollers were a Scottish Boy band for about 5 minutes. Jellyfish! It doesn’t get much more beatlesqie than that. Aimee Mann’s first two albums. I was expecting to see Jellyfish on the list too! But of course they could also be paired with The Beach Boys and Queen, among others. Jellyfish is the no brainer. I suggested to Andy Partridge that he, Moulding, Difford and Hillbrook should put together an album together. Maybe with Manning on keys? There’s the group World Party whose sound is totally inspired by The Beatles. Saw Gary Lauris (sp) at a house concert in Norfolk just a few weeks ago. An amazing songwriter and solo performer as well! I can certainly see the Beatles connection. Lot’s of them…Jellyfish, Enuff z ‘Nuff, Pilot, Klaatu, Dada, The Merrymakers and The Trampolines from Sweden…Los Shakers from Uruguay! PEOPLEMANIA is a band that writes songs with BEATLE FANS, and some pros very close to the BEATLES. This includes a song written with John Lennon’s sister and Ringo’s producer. PEOPLEMANIA, has humor, and personality. They are producing a rock opera called The Wizards wants to be in the Band. It’s a combination of Disney’s Fantazia meets Monty Python. With a cartoon narration starring the voice of Joey Milk and, lead guitarist and vocalist of The Beatles produced band BADFINGER. Watch for them in Vegas! Typo Joey Molland of BADFINGER did the cartoon narration. His Liverpool voice makes it sound like a Disney film. Crowded House is a New Zealand band, not Ausie. Neil and Tim Finn are Kiwis but Nick Seymour and Paul Hester are(were) Aussies. Would be probably fairer to call the band Australasian. Great to see them listed here, though. It says they were formed in Melbourne Aus. even if the Finn brothers were Kiwis, so Crowded House is essentially an Australian band. Good list, and great to see both Crowded House and XTC mentioned. I was surprised there was no mention of The Cars, though – the closest any American band has got to the Beatles sound (check out the Harrisonesque guitar solo on “Best Friend’s Girl”). Sloan. All four members sing and write. 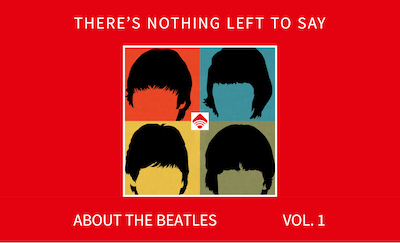 Their album Never Hear The End Of It is a 30 song masterpiece (like that other 30 song double album by the fabs). Like the white album it’s an eclectic affair but they never sacrifice melody. Particularly Beatlesque are Right Or Wrong and Can’t You Figure It Out? I was going to mention Sloan, also (the Canadian Beatles?). And like the Beatles, all four members write and sing and play multiple instruments. Very late reply, but Navy Blues…definitely! Sloan is one of my favorites! You left out Tears for Fears but included The Flaming Lips? I’m with you. TFF released ‘Sowing the Seeds of Love’ which is like later period Beatles albums condensed in to one song. Flaming Lips only appear to be included because they’re considered experimental- most of the songs quoted are from Yoshimi battles the Pink Robots, none of which remind me of the Beatles in any way. Mole from the ministry would’ve been a better choice. To complete the Monkees connection: Davy Jones, then performing in the Broadway show “Oliver!”, was on the same Ed Sullivan show as The Beatles. Excellent list and I’d also put XTC up at the top of the list for the reasons stated. I’d also list the Jam, one of the UK’s most popular bands ever. From 1977 through 1982, they ruled the U.K. airwaves with an amazing run of singles and LP’s showcasing Paul Weller’s lyrical and melodic songs, many of which are very beatlesque. Weller was hugely influenced by the Fab Four and many of the Jam’s songs, including their “Taxman” homage, “Start” from 1980 and “It’s too bad” from 1978’s “All Mod Cons”LP have that magical Beatles sound! I think the list was in alphabetical order? XTC was a breakthrough band. Their innovative arrangements and songwriting, great grooves and quirkiness was liberating for me. It triggered a creative explosion in me that was an endorsement of the uninhibited ideas that started with the Beatles. Surprised that the band Klaatu wasn’t on the list. When their first album was released in 1976, without credits, a rumour started that this was the Beatles reformed. The song Dr Modesto sounds like a George Harrison piece and the song Subrosa Subway sounds like an outtake from Magical Mystery Tour. It even includes a Morse code message at the end that translates: we’re here, we have returned…one of the many “clues” that this band was the Beatles. The Flaming Lips covered the entire Sgt Pepper album and parts of it are pretty decent. Oasis didn’t simply ape The Beatles. They also had Zac Starkey in the line-up. Aside from that the tracks chosen after each choice make a sublime playlist. But The Bangles? Ahead of The Rutles? That is almost as odd as Revolution 9. You obviously haven’t heard all the Bangles’ abums. 10cc should be on the list as well. Not only did they have clear Beatlesque influences, but all four shared in writing and singing. And like Lennon and McCartney when the original 4-piece band split, they did so along the lines of experimental/avant-garde (Godley & Creme) and saccharine pop (Stewart/Gouldman’s incarnation of 10cc). They also had connections with the Beatles: Eric Stewart played lead guitar on some of McCartney’s solo work, and McCartney also recorded tracks in the studio they build, Manchester’s Strawberry Studios: named for a John Lennon song. Absolutely spot on. The albums with all 4 are the best. This is a great list and I agree with many of the suggested additions. And I might have just missed it in the comments, but I think The Rembrandt’s belong on this list. Their whole debut is full of Beatle-inspired stuff, but if you want one song that’ll really smack you in the face, give “Every Secret Thing” a good listen. BTW, no apostrophe in Rembrandts – stinking auto-correct! A better Cheap Trick choice would be “Taxman, Mr. Thief,” and XTC’s “Black Sea” – their true gem – is very Beatlesque. As mentioned above, Klaatu and The Rutles are glaring omissions. I always thought Oasis mimicked The Kinks more than The Beatles. The list should have had the Raspberries and Jellyfish to make it a complete list!! Hey, is this the Tom Feeley from Enuff Z’Nuff days? Anyway, for the John Lenon sound Donnie Vie has it down. The band’s live performance included many off the cuff Beatles tunes. The band was unfortunately stuffed into the hair band box and never recovered. But next to Cheap Trick they had the Midwestern beatles sound down with their own twist. Check out the MonaLisa Twins who debut album When we’re Together is doing good job of reintroducing the beat music style of the 60s to the world again. You won’t regret listening to their YouTube videos. There’s a “second degree” Beatles-Crowded House connection: The Byrds’ Roger McGuinn performed and recorded with that Down Under band in the late 1980s. There are a lot of obscure bands like The Red Button and The Minstrels (from Canada) who were deliberately Beatlesque or embraced Merseybeat, and there’s no way to include them all on a list like this. But there should be at least one Elephant 6 band, and I would go with The Minders. Check out their album “Hooray for Tuesday” and see for yourself. Red Dot out of LA comes closer to theBeatles than any of the above bands. Elvis Costello AND the Attractions. Doesn’t even need explaining. After John’s death, I was really hoping Elvis would step in for a Beatles reunion, which sadly cannot happen now, though one could nominate Eric Clapton to take over George Harrison’s role. Also, of course, Tom Petty AND the Heartbreakers. Raspberries should have made the list! The Nines! (Steve Eggers) The album Gran Jukles Field is all over the place in terms of styles, but is a pop masterpiece. While I’m at it, the album Lurch from Mike Viola is absolutely FANTASTIC. Beatles fans would love him. Find the Paul McCartney tribute concert ‘Pure McCartney’, and listen to him sing Dear Boy and Maybe I” Amazed. It’ll knock you out of your chair! I’ve never understood the Oasis thing. I don’t think they sounded much like The Beatles. Their rivals Blur on the other hand. Modern Life Is Rubbish, Parklife and The Great Escape are very Beatlesque. Of course! Who could forget Blur! World Party is a definite. Most Beatle fans also have World Party. Also, Misex out of Australia, featuring “Castaway” and “Blue Day”. The Vinyl Kings’ A Little Trip album is a wonderful ode to Beatle-esque themes and sounds! I whole heartedly agree with your choices!!! I would also add “Jellyfish” & “Supergrass” to this list. I do have some reservations about what you picked as some of the artists most Beatlesque tunes, but hey, music is subjective! All great additions to a great article. I’ll have to add Pugwash to the list. Thomas Walsh and his squad are built from the pieces of a Beatles /ELO trainwreck. Second that! Everyone I know in the power pop frame of mind has been instantly become a Pugwash fan when they’ve heard their track “Apples”. Owes a lot to XTC (Andy P did release a compilation on his Ape label!) and Jeff Lynne. Hey, when you look at the list of the Pugwash fan inner circle you’ll find Jeff (who appears on their last album, as does Ray Davies), Michael Penn, Dave Gregory, Ben Folds, Andy of course, and many other rock luminaries. There’s a great pic of Ringo holding their album too! You missed a major Fountains of Wayne Beatles connection: Adam Schlesinger wrote the song “That Thing You Do!” for the Tom Hanks film of the same name. His assignment was to write a song that sounded like the Beatles from 1964. Anybody who’s heard the song knows that he nailed it and Mike Viola (mentioned in another comment here) deliverd the perfect lead vocal on that track. I agree with lots of the bands you all have listed but you missed the band Cherry Twister which has that 60’s pop sound completely dialed in. “That Thing You Do” is an absolute gem. A perfect confection for a totally entertaining film. Tim Christensen’s “Love Rears Its Ugly Head”. Look for the album not live version from ca. 2008. It’s hard to beat that for Beatlesque sound! Olivia Tremor Control’s two albums are in the Sgt. Pepper/Magical Mystery Tour vein of Beatles psychedelia. The Pretty Things – SF Sorrow / Parachute, Love – Forever Changes and the first two, Aphrodite’s Child – 666, The Cure – just about everything especially from around 83 forward, Guided By Voices – Bee Thousand and everything else, Maybe The Grifters just as an addendum to GBV, and because I like them better, Pavement obviously, The Go-Betweens – 16 Lovers Lane and everything else, Maybe Prefab Sprout – Steve McQueen and most other stuff (goes good with stuff like Crowded House & Tears For Fears), The Church just for being the most consistently good band that make better records as they get older, and they’re in their 60’s or something, Love & Rockets – maybe, The Beta Band & the better imo The Aliens – Luna, Just about the entire Creation Records catalog Teenage Fanclub – All of it – gold, Arnold – Hillside & the rest of it, Ride, My Bloody Valentine, Swervedriver, House of Love, The Boo Radleys, Super Furry Animals, and the aforementioned band that ended that label and music in general or so it seems, Oasis. Oh, and Phil Collins of course. Have hou heard The Weeklings? They have very much nailed the sound of the Fans.. With their own touches. Find them on YouTube. Glen Burtnik formerly of Styx is in this band. Highly recommended. Their second album was recorded at. Studio 2 at Abbey Road. Even the cover of their album is a take off of the American LP The Beatles 2nd Album. Be BIG. A list straight from my own heart, Scott. Love your inclusions, especially noting The Knack, giving props to The Monkees and bringing in the definitives such as Badfinger, Bangs, Cheap, House, ELO, FOW, et al. Awesome. As I have replied to others comments, I suggest The Raspberries (Carmen was very McCartney-esque … still is I suppose), Jellyfish had their moments … Paul Weller toyed with the sounds on the Jam’s SOUND EFFECTS and ALL MOD CONS (“It’s Too Bad” has that guitar refrain doing “yeah, yeah, yeah”). Many of the respondees had great suggestions. I love anything Beatlesque. Well written and informative piece. If singer /songwriters were allowed to be on this list, I’d include Michael Penn. I’d also add William James McCauley (Bleu)’s one-off band, the Major Labels. But I don’t agree that there should actually be a Beatles connection to have a Beatlesque sound. Del Rivers is right – nrbq should be here. Joey Spampanato is a real McCarney- esque writer and singer. Also Raspberries for sure. The Temples is another band. A lot of the above!! For me, so many albums/bands come to mind, but a lot are obscure or hard to find. XTC – Apple Venus Volume 1 – super Sgt. Peppery but kinda out of print? Some Field Music, although they are more like XTC. I dunno, they are out there, but need research to find. Klaatu is the most beatlesque band I ever heard. It’s really a shame it isn’t included here. Math and Physics Club are the modern day Beatles. The Spongetones have to be on this list. Where are The SpongeTones? They are one of the most Beatlesque bands ever. Check out their debut album BEAT MUSIC (collected on the twofer CD, BEAT AND TORN). However, any and all of their dozen albums scream BEATLES. (Also — Jellyfish, Klaatu, The Wondermints). absolutely incredible and their ballads such as hotel and desperado as well as their Hard rockers such as life in the fast lane would have beem great beatle songs. They were what one man deacribed the beatles a rock band with the ability to play music. Surprised no one has mentioned the Posies. Consistently strong power pop songwriting, no doubt influenced by the Beatles. Great list, though honestly you could list 100 bands which wear their Beatle-loving hearts on their sleeves. You could easily add such bands as Stealers Wheel and The Church to the list, for instance and – despite their rougher sound – Nirvana were extremely Beatles influenced, as are their inheritors, Foo Fighters. Excellent to see Swindon’s finest, XTC and NZers Crowded House on the list! DR. DOG > The Beatles ???? The Avett Brothers. Check out Will You Return and I Never Knew You, among others. Positively Beatlesque! With Jeff Lynne/ELO he had huge respect for the Beatles, it went full cycle, as the Beatles had huge respect for Lynne, who ended up producing the Beatles and three members in solo projects. The Carpenters. I know this list is trying to be hip but they outsold all American acts for the decade of the 70s and their first record was a remix of Ticket to Ride and they also covered help for a while. You forgot America’s answer to The Beatles. THE BEAU BRUMMELS. Guadalcanal Diary. Specifically the album “2X4” featuring “Lips of Steel” (A spot-on John Lennon solo sounding jam complete with Lennonesque voice echo and a short backwards vocal slice).